As the first sourcebook of its kind, and one focused on a different point in time than presented in the core rulebooks, Dawn of Rebellion is all about context. This context informs what connections the player characters will have to each other and their galaxy, and this is reflected in a heap of new options that are inspired by many of the iconic characters introduced in Star Wars Rebels™ and Rogue One: A Star Wars Story™. While these works are primarily focused on the military aspects of the Star Wars™ saga and would take place in a Star Wars: Age of Rebellion™ setting, considering the individual stories of these characters should give ample inspiration to be housed in Edge of the Empire™ or Force and Destiny™. Jyn Erso was little more than a criminal after being abandoned and then rescued by the Rebellion. Chirrut Imwe’s path of devotion to the Force may have taken him far from the temple on Jedha had events unfolded differently. Hondo Ohnaka (probably) doesn’t spend all of his time swindling Rebel cells into helping him acquire plunder and then escape to plunder another day. The adventurous lives of characters we see on the screen for only a short time can point towards campaigns in Edge of the Empire or Force and Destiny, or even finding where the intersections of those themes create some of the most memorable and beloved Star Wars stories! 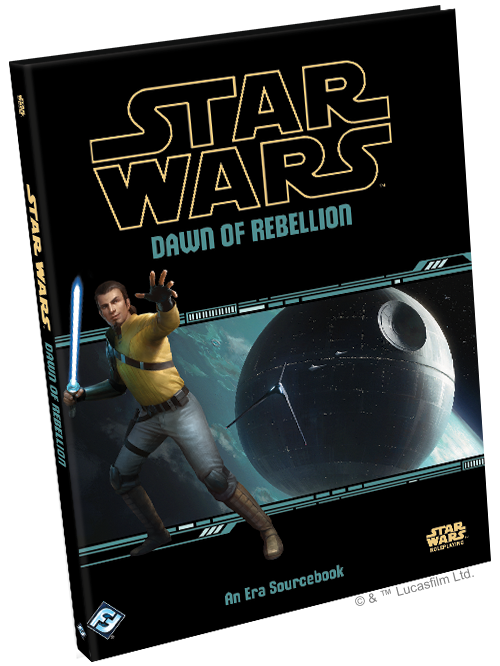 As such, the Dawn of Rebellion sourcebook contains an unprecedented six universal specializations designed to bolster any character’s abilities while also providing a strong narrative link to that character’s backstory and future. Four new species choices, each with unique traits and histories describing their place in the galaxy, also contribute to a richer game setting for players and gamemasters to explore. The Retired Clone Trooper talent tree is as reliable and robust as a clone trooper is expected to be. After the rise of the Empire, the ranks of Republic clones were replaced with more conventional beings instead of vat-grown duplicates, and so these clones have dispersed throughout the galaxy. Disposable soldiers who served their purpose, many surviving clones grapple with guilt over their betrayal of their Jedi generals at the execution of Order 66 and the coronation of a tyrannical Emperor. But rather than wallow in remorse, some of these clones find their way back into the warrior life in the name of the Rebellion, perhaps seeking atonement for the sins of their brothers. Featuring an unusually high six new career skills, the talents for the Retired Clone Trooper are focused on all-around consistency and character improvement. Eighteen of the twenty talents in the tree are passive, meaning they simply add an ongoing benefit to various stats and abilities such as wound and strain thresholds and explosive damage. One of the activated talents at the end of the tree is Comrades in Arms, themed around the formidable battle prowess of squads of clone troopers. Once per encounter, the character may make a Discipline check to grant themselves and allies bonus defense until the fight is finished. No Such Thing as "Snow Wookiees"
Perhaps owing to the harsh wintery conditions of their native planet of Gigor that requires cooperation and community to survive, Gigorans are often accurately referred to as ‘gentle giants.’ Gigorans stand over two meters tall with long and powerful arms and torsos, but their imposing figures are belied by their friendliness and almost joyful curiosity. Unfortunately for them, these traits have proven to make them easy prey for the galactic slave trade that puts a high profit margin on powerful-yet-easy-to-control laborers. When first discovered and exploited, their stature and shaggy white fur led slavers to market them as “Snow Wookiees,” which was a very useful fiction. Now, nearly every Gigoran encountered off their homeworld is either in slavery or has escaped it. Such a traumatic experience has different effects on individuals with some aligning themselves to the noble cause of freedom for all beings while others become so twisted and corrupted that they find that causing pain to others is the only way they can protect themselves from worse. 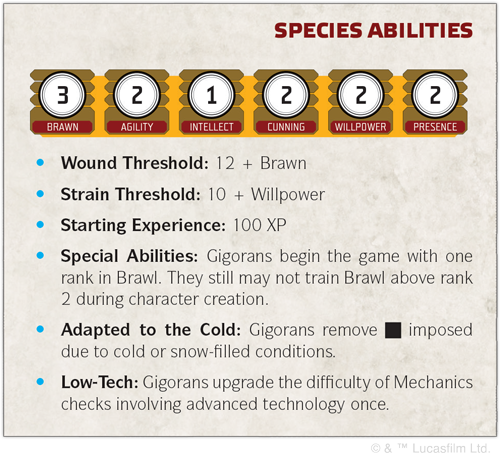 Gigoran player characters benefit greatly from their natural Brawn and free rank in the Brawl skill, while their pragmatic hunter-gatherer society has inhibited their Intellectual growth, as well as imposing and automatic upgraded difficulty on Mechanics checks related to advanced technology. One can safely expect not to find too many Gigoran scholars or engineers, but escaped slaves have been able to find ample opportunity as mercenaries, bounty hunters, and soldiers. Stay alert for more information on how gamemasters will be provided more insight into crafting vibrant and thrilling campaigns set during the height of Imperial power, and be ready to pick up your copy of Dawn of Rebellion (SWR10) when it launches in Q4 of 2017! Pre-order your copy at your local retailer or online through our website today!